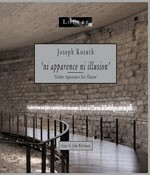 Published on the occasion of Joseph Kosuth's installation 'Neither Appearance Nor Illusion', an exhibition in the Medieval Louvre, October 22nd 2009 to June 21st 2010. Joseph Kosuth installed on the foundation walls of the original Louvre palace 15 neon text lines he appropriated from an artwork he developed to be read on the Internet, a project for young artists at the Brooklyn Museum. In this context combining a medieval archeological site with a historical art institution the exhibition circuit unfolds the field of potential meanings that always has been the hallmark of Kosuth installations. Entitled 'Neither Appearance Nor Illusion' in reference to Nietzsche, it is undoubtedly one of the artist's most successful and spectacular interventions to date. Texts by Henri Loyrette, Marie-Laure Bernardac and John Welchman and an interview between Joseph Kosuth & Jacinto Lageira.